I wish it was Friday! I’m just going to dive right in. Dinner last night was tacos. This one is on our regular rotation of meals in our house. 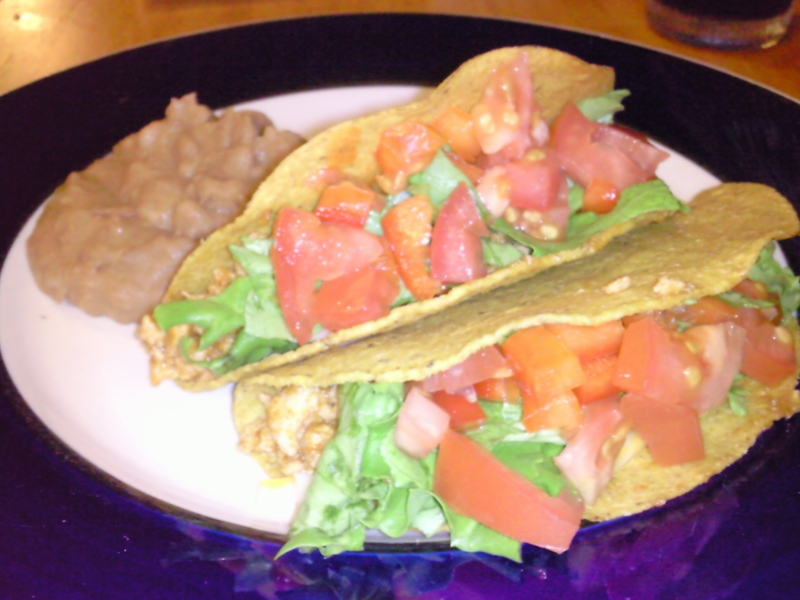 Ground turkey, taco seasoning, and fat-free refried beans make this meal easy. I add veggies to mine. See the pretty arrangement? 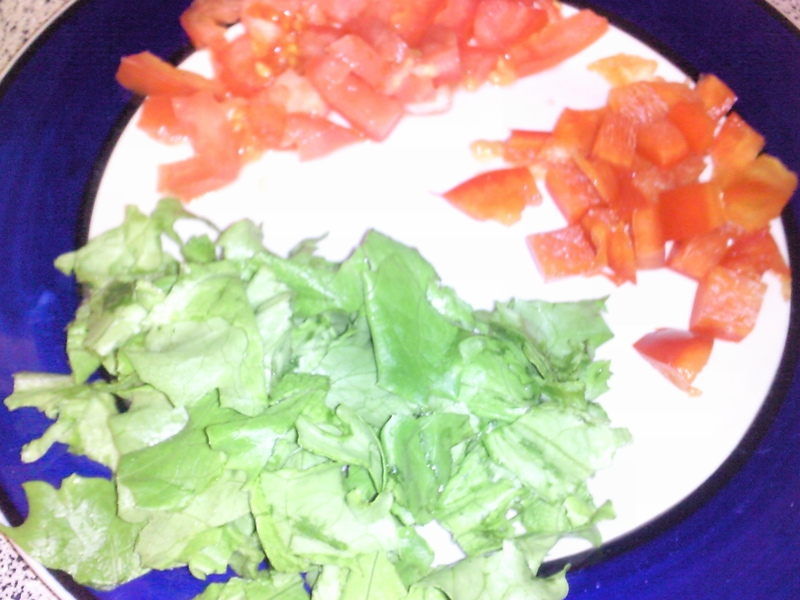 These diced tomatoes, bell peppers, and lettuce are all mine! Whatever did not get shoved into a whole grain corn shell, will be dumped on my plate afterwards and mixed with the taco droppings and remaining beans for a smashing good taco salad. I will without fail eat SOMETHING sweet and delicious every single night! I must have it! Last nights fare was a bowl of cinnamon baked apples. 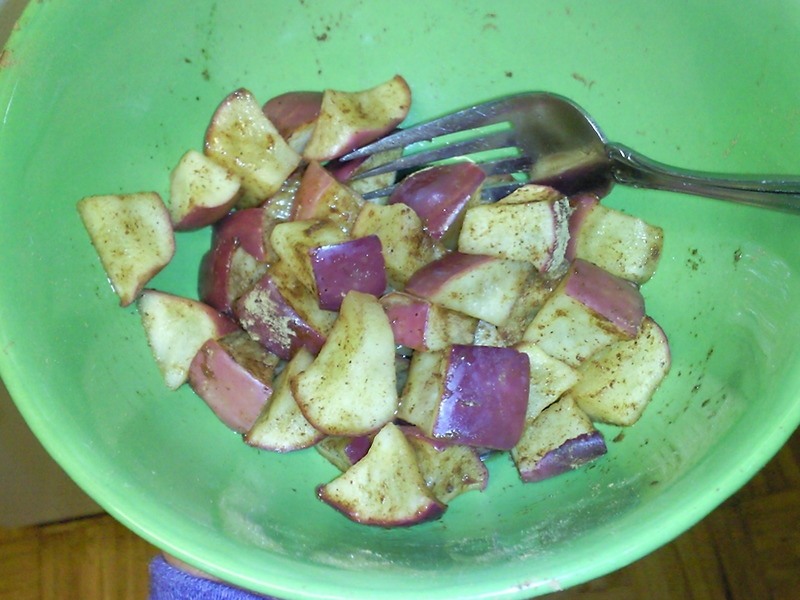 Diced apples, sprinkled in cinnamon cooked in the mikey for 2 minutes. OMG!! I now need to buy more apples. I love this stuff, and good for you. 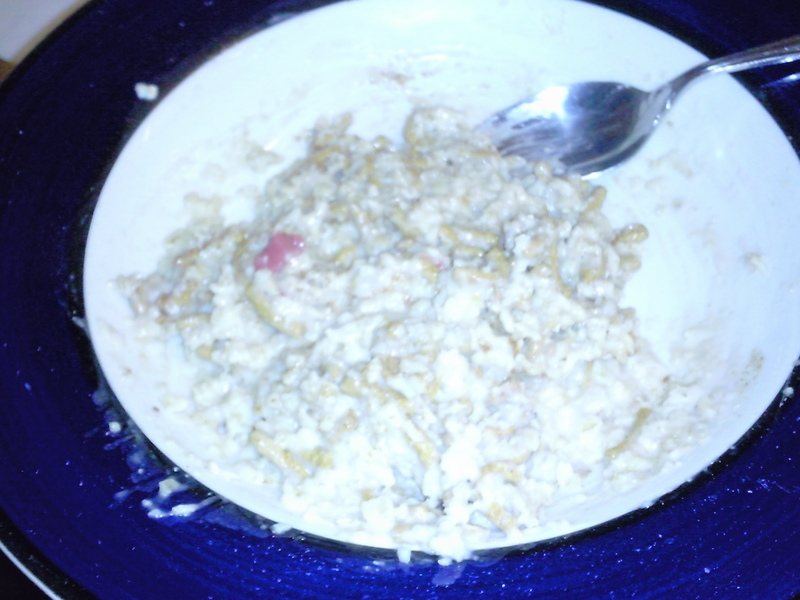 This morning for breakfast – get ready for more photo-riffic gems-I had oatmeal with a scoop of strawberry yogurt and 1/4 cup Fiber One cereal. There was some cinnamon sprinkled in there too. Is there anything cinnamon is NOT good on? I might have to think about that. 4 hours later, I was starting to get hungry again, and dang! It’s only 9 am! 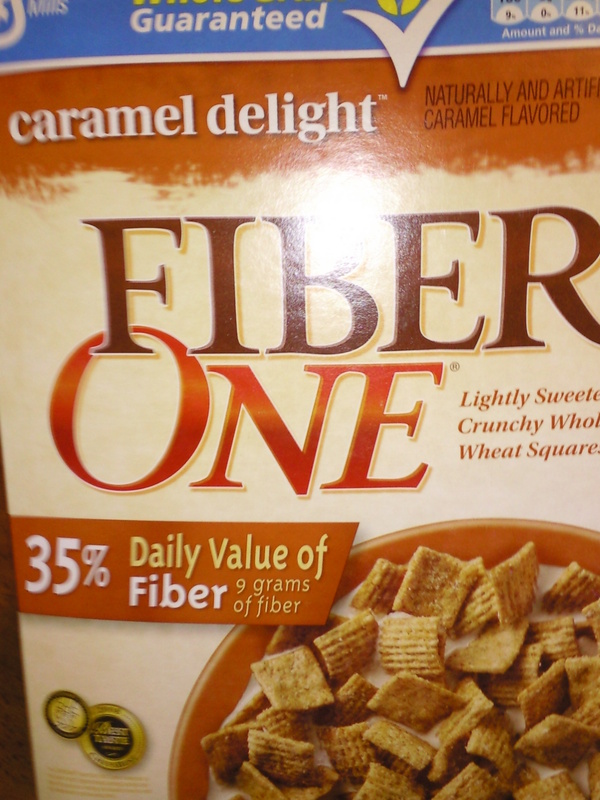 I am thankful for the box of Fiber One Caramel Delight Cereal I bought last night. I had packed a cup of the stuff today and it was pretty darn good. 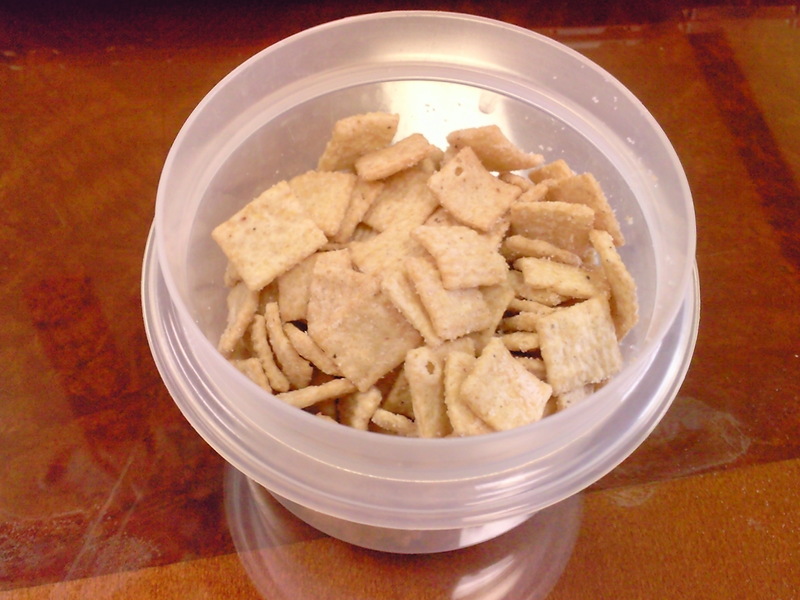 I ate some this morning as my snack, and will probably eat the rest this afternoon with my yogurt mixed in. So today is Friday folks for most of you. It’s like Monday for me, oh wait it’s still Friday for me, but I don’t have a day off until next Thursday – so that should make it Monday or is it Tuesday…you get the idea. It’s my long stretch. Only once a month but it happens. I’m lucky and thankful to have a supporting hubby and loving family who understands that working Momma’s have to do what working Momma’s have to do sometimes. So it’s off to do just that. Work. Later!